Exactly what would a woman or a man do for true forbidden love? Would she stop seeing the man she was in love with in order for him to get medical attention? Would he stop seeing his wife and kids if a big wealthy organization told him that they would take care of them for the rest of their lives (knowing that he couldn’t), if he promised never to see them again? These are just a few dilemmas that the author’s parent’s had to face. “Every Valentine’s Day I’m reminded of how loving and helpful my mother was to everyone she knew and the sacrifices she had to make in order to take care of us. In honor of her memory I’m going to give away several copies of “Everybody Calls my Father, Father” to several of my Facebook friends. Just go to my Facebook page to enter,” said Tim “Dr. Hope” Anders. 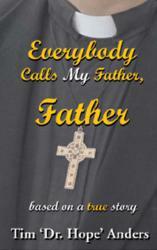 Valentine’s Day is all about love; his book, Everybody Calls My Father, Father, is all about love and what can happen if you love someone you’re not supposed to and the price you sometimes have to pay. The character of a tenacious young woman, Bouvette Sherwood (the author’s mother), who is a successful New York Broadway producer and actress, drives the plot. In the mid 1940s Bouvette meets and falls in love with a charming alcoholic, Hughie Hewitt. He has a secret though, which he keeps from her during their intense courtship—he is a Catholic priest. For years their steamy romance and covert living arrangements are successfully hidden from the suspicious eyes of the church. After spawning two children their deception becomes increasingly difficult to conceal. Their love story unfolds into a kaleidoscope of intrigue, suspense, betrayal, and romance.